The top half took to the stage on Tuesday at the Australian Open. It was another strangely uneventful day with just three seeds going out. That’s six seeds out through the first two days – not many at all compared to recent Slams! After a long day at work, i’m already flagging 😴😂. Read on for highlights from day 2 at the Australian Open. Much like day 1, the three “upsets” on Tuesday were all matches you would have circled as seeds in danger. I am so torn with this result – thrilled for Timea but gutted for Dasha. From the comments I saw on social media, I don’t think I can bear to watch it back. It’s been a rough start to 2019 for Kasatkina who clearly has very little confidence at the moment. Still, I refuse to jump on board with all the negativity when it’s only been three losses from three weeks of tennis. It’s very early days in 2019 so I am hoping Dasha can make some adjustments and improvements, and find some form before defending final points at Indian Wells. For Timea, i’m just so pleased to see her back competing, seemingly healthy and picking up quality wins. I was delighted to find her press conference on the Australian Open YouTube page. She’s so thoughtful with her answers and always a fascinating listen. A decent draw in the next round too against Natalia Vikhlyantseva. Venus Williams rallied from a 6-7 3-5 deficit to score a gutsy win over Mihaela Buzarnescu. Based on recent form, I was surprised it was so close. The Romanian player has been winless on tour since badly injuring her ankle in Montreal last year. I was expecting more outward emotion from Buzarnescu based on my memories of watching her play in 2018! I can understand she must have been nervous serving for the match having lost her last seven matches. I feel like there were still plenty of positives to take away from this match and that Buz is starting to find her game again. From 4-5 down in the second set, Williams pounced, suddenly charging the net and playing much more aggressively. It was a tactic that totally paid off with Williams winning 13 of 14 net points in the second set, and most of them coming in the final few games. Venus is one of the smartest and most adaptable players on tour. In a battle of players who had yet to win a match so far this year, Zhang Shuai edged Dominika Cibulkova in three sets. Since winning her first ever main draw Slam match at the Australian Open back in 2016, Zhang Shuai has never failed to not make it past at least the first round. Simona Halep snapped a five match losing streak to win her first match in five (!) months. Kudos to the world number one who rallied from a set and a break down to avenge her US Open loss to Kaia Kanepi from last year with a 6-7(2) 6-4 6-2 victory. I’ve just watched back the end of the match and am hoping to find the first half once i’ve trawled through the replay section on the Eurosport Player! What a HUGE win for Simona. This is a stunning photo of Venus posted by the Australian Open Twitter account. A lovely moment between teens, Bianca Andreescu and Whitney Osuigwe, who left everything out on court through three draining and entertaining sets. Andreescu, who was struggling physically at times, prevailed, 7-6(1) 6-7(0) 6-3 to set up an enticing second round match against Anastasija Sevastova. This is a difficult watch. Victoria Azarenka admitted that she is currently struggling after a three set loss to Laura Siegemund. Siegemund scored arguably the best win of her comeback from a serious knee injury, coming from a set and a break down to win, 6-7(5) 6-4 6-2. Azarenka said practices had been going well but she had not been able to translate that to the match court. I really admire her attitude and spirit, and it’s clear that she has been through so much in her personal life through these past few years. I believe that with her character she can turn it around. As she Vika stated, it will require time and patience. In terms of seeded upsets, I’m going for Sasnovich over Kontaveit, Vondrousova over Martic and Anisimova over Tsurenko. I’m intrigued to see what Peterson can do against Sharapova as I was super impressed by the Swedish player in 2018. Pavs-Bertens should be good but I tend to think Bertens will be too solid. Not feeling any upset alerts with Wozniacki, Kerber, Sabalenka, Stephens and Barty. I’m always a tad wary with Kvitova but I think she will be OK 🤞. The first two days were so calm so I am kind of expecting some seismic shock on Wednesday?! Follow Moo’s Tennis Blog on Twitter, Facebook and Instagram. 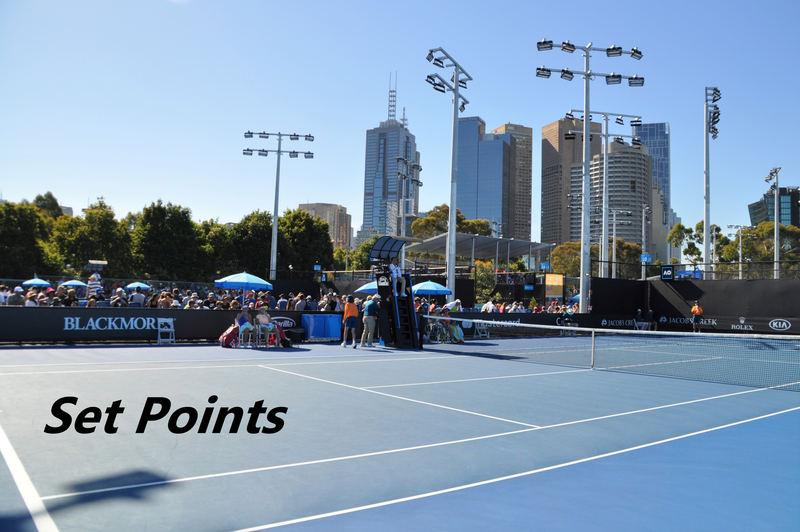 January 15, 2019 in Australian Open, Set Points, WTA. Monday’s Set Points, AO 2019 Day 1: Sakkari & Collins upset seeds, Putintseva-Strycova handshake! ← Monday’s Set Points, AO 2019 Day 1: Sakkari & Collins upset seeds, Putintseva-Strycova handshake! Yes and sounds like Tsurenko’s ankle is OK. I really like Anisimova so think it should be a tight match. Anisimova is definitely one to look out for, she has an attitude and mindset of a future champion. I hope it translates well onto her on court game since she is still a developing athlete. Couldn’t agree more, what a stunning scoreline over Tsurenko! Wow well you were right! Disappointing from Tsurenko, though. I’m really liking Sloane Stephens right now, I just wonder if that #1 will factor in at all and nerves will crop up. Didn’t expect that scoreline! Yes i’d agree on Stephens. I really liked Bertens in this section but now she is out, a decent draw to the QFs for Sloane. A long way off but seeded to meet Kerber in the QFs who she has a great record against. Yeah a Kerber v Sloane match would be awesome, although I’m hoping Garcia goes on a surprise tear and comes through that section. Wouldn’t shock me at all if she loses to Collins in r3 though! What are your predictions for Svitolina v Kuzmova? I’m surprised they’ve gotten Rod Laver, but there’s definitely potential for an upset there although I would expect Svitolina to be pretty alert to that. Ah sorry missed this, I really like Kuzmova and I think she’s going to have a breakthrough year. Needs a big win, feel like it’s not far off. And yes, I’d go for a Collins over Garcia tbh but we shall see! Oddly, I don’t feel like any of those upsets will be that big of a surprise. The matches are well balanced. Kvitova should come through, as Sharapova should too. Pavs is playing well, she was a good matchup for Kiki. Looking for Bencic to come through but Yulia can be a handful. Upsets coming on Friday or Saturday would be intriguing, those third round matches are when things start looking really peak, eyeing Barty against Sakkari, Sasnovich against Pavs. Imagine if the WTA had gone along with the top 16 seeding plan they had for 2019, that may have produced a bloodbath starting on Day 1.